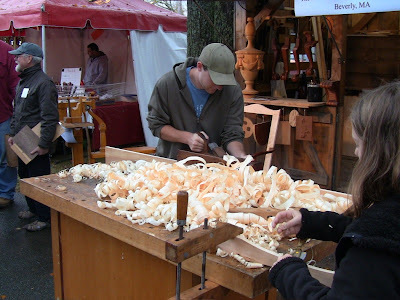 Phil Lowe hands out fresh spiral shavings to passers-by. Dana Smith gets ready to help out for the evening inside the booth. 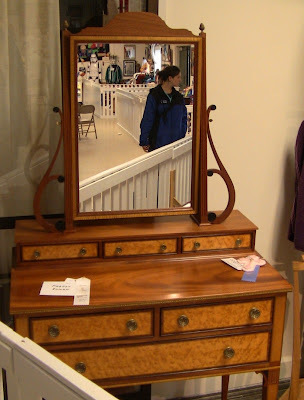 This weekend I had the privilege of helping Phil Lowe promote his Furniture Institute of Massachusetts at the Topsfield Fair, in Topsfield, MA. Begun in 1818, Topsfield is the oldest agricultural county fair in the country. 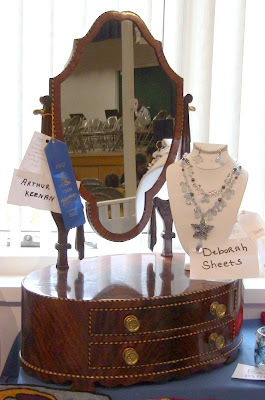 It's a typical county fair, with agricultural displays, arts and crafts, rides, small business vendors, and food vendors. Lots of food vendors! It runs through October 8. 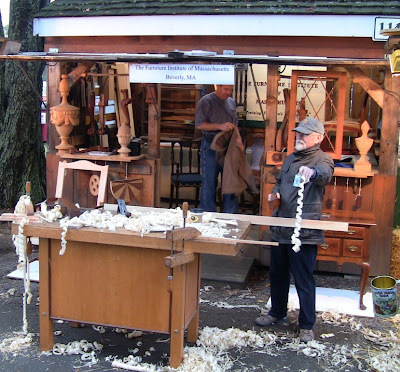 Phil's booth is located on a small loop with other craftsmen near the Kiddieland. 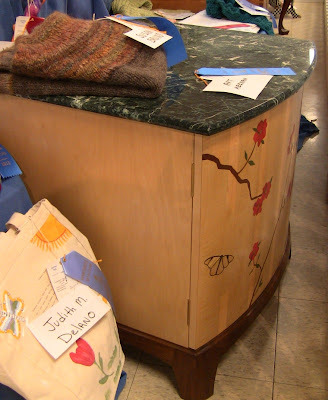 Prior to opening the Institute, Phil was an instructor at Boston's North Bennett St. School from 1975 to 1985, the last 5 years as head of the furniture-making program. 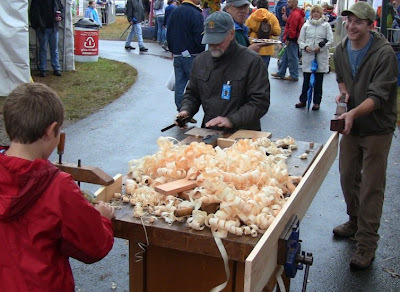 He's been a contributor to Fine Woodworking magazine for most of its history. 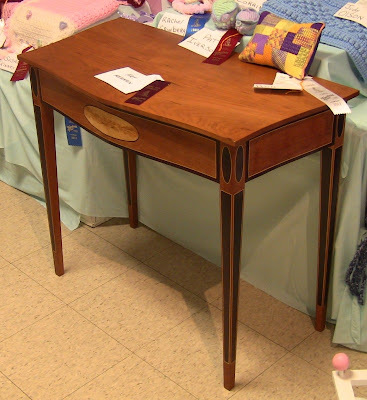 In 2005, he was awarded the Society of American Period Furniture Maker's Cartouche Award. I consider him one of my true woodworking heroes. Helping out at the fair was my way of paying back for the all the knowledge I've gained from his articles and videos. The weather was damp and gray. Back when I was a Scoutmaster with my son's Boy Scout troop, this was typical Fall camping weather (where the boys would tell you it rained 25 hours a day). Fortunately the light rain tapered off by the time we had the booth set up Saturday morning, so we pulled the workbench out front. Phil clamped an 8' pine 1x8 in the vise and started planing full-length curls off the edge with a wooden coffin smoother (notice the board has been somewhat reduced by the end of the day in the photo above). He also had a wooden jointer and a Stanley #4 of about World War I vintage with a Hock iron. As people walked by he offered them shavings to drape around their necks or over their heads. The kids played with the tight curls like wooden Slinkies. I clamped a small piece to the corner of the bench and started working on it with my Lie-Nielsen spokeshave. As people stopped to watch, I asked them if they'd like to try it. Most did, men, women, boys and girls as young as 4 or 5. Phil was a little worried about someone dropping my expensive spokeshave, but I want people to see what top quality tools feel like. A well-tuned spokeshave is highly addictive. It works so easily and leaves such a smooth surface. I explained about using it for curved work, while the planes make things flat and straight. I also showed people how to skew it and produce little corkscrew shavings. While some took just a few passes with it, many kept at it, fascinated. I also clamped a couple pieces to the opposite corner and set out my Spofford brace with a half-inch bit. I like to tell people about the history of the brace, which has a patent date of 1859 and is marked "Fray and Pigg". Since Messrs. Fray and Pigg parted ways in 1869, that dates the brace to a 10-year window. It might have been around when Lincoln was president. It still works beautifully, my favorite work brace. I had them drill holes with it, not putting any pressure on the pad and observing how the lead screw pulled it into the wood. When one is at the fair, one must eat fair food. 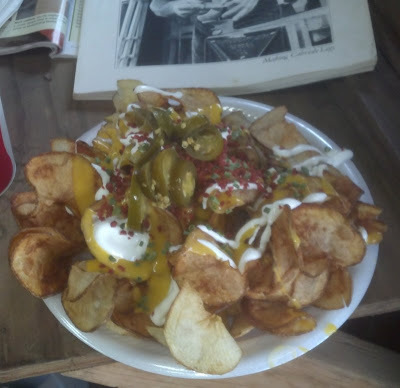 Mmmmm, jalapeños on spiral potato chip fries, with sour cream, cheese, and bacon bits! Wilbur Pan assures me via Twitter there's vitamin C in those potatoes, so this is healthy. Just visible above the plate is my copy of the September/October 1983 Fine Woodworking, with Phil's article on making cabriole legs. After lunch, while Phil worked on a chest of drawers he's building inside the booth, I picked up the planes and continued to make shavings. When people stopped to watch, I asked them if they'd like to make their own. I showed dozens of people how to grip the various planes and guide them along the edge with their fingers down the length of the board. Most were able to get a decent shaving within a couple tries. For the kids who were too short to get over the tool, I pulled it from the front. That worked especially well with the wooden jointer, half as big as they were. Then I would have them try the spokeshave and brace. When a good crowd built around the workbench, there was activity on three sides. All of this was a great way to engage people and tell them about the Institute. Many were just having fun as they passed by with their families, but a number looked more closely at the sample work and picked up fliers. I had several in-depth conversations with quick impromptu lessons. In addition to full-time programs, Phil offers weekend and weeknight sessions. He covers the full range from hobbyists with limited time to people looking for career training, from beginner to advanced. The Institute is state-licensed and approved for veterans GI Bill. Whenever someone says they can't do it, I tell them it's like learning to play a musical instrument. You don't try to play Mozart right off, you learn the techniques and practice to develop the skills. Throughout the day, we had a young visitor who really loved the spokeshave, six-year-old Julian. His mother was one of the blacksmiths at the nearby Prospect Hill Forge booth. In between other people trying it, he spent about an hour working the piece of pine I had setup down to almost nothing. I set him up another piece, and he said he wanted to make a chair leg (Phil had a number of leg samples set out, in additional to the frame for an upholstered chair). 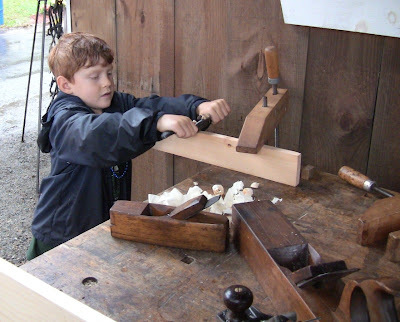 So he spent the rest of the day shaping it and showing other kids how to use the spokeshave. I love seeing kids get fired up like that. I headed home at 5 after Dana Smith arrived to help Phil for the evening. Use it only with Mom's permission. Don't let your friends play with it. Don't touch the sharp part. He was ecstatic, and immediately went to work on his second chair leg. 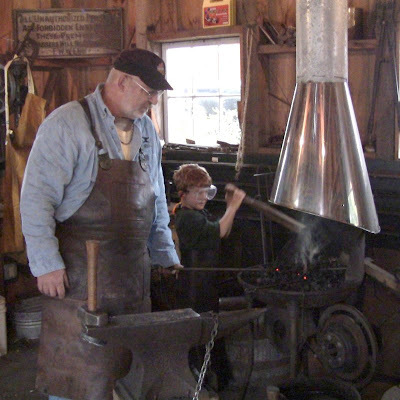 Julian pumps the air supply for the forge while the blacksmith heats a piece. By the time this kid is 16, he'll be able to make anything. Anything! Julian puts his new spokeshave to work. 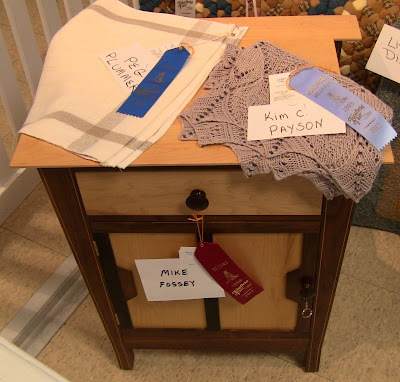 Several of Phil's instructors and students had pieces in the Coolidge Hall arts and crafts displays. You can see the type of work people learn to do at the Institute. It's just magnificent, covering a range of styles. Dresser by Freddy Roman. You can read a profile of Freddy here. 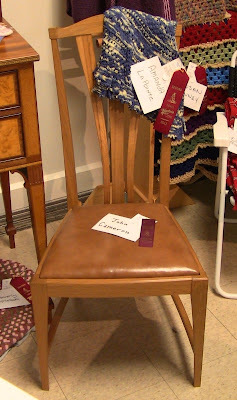 Side chair by John Cameron. 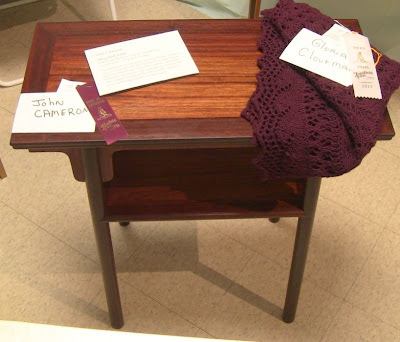 Side table by John Cameron. 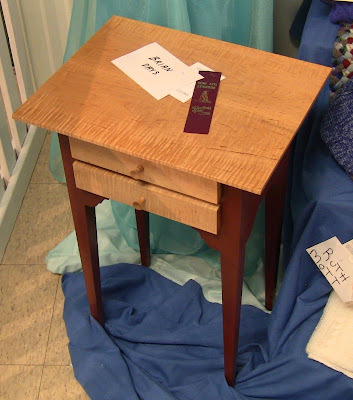 Side table by Brian Days. 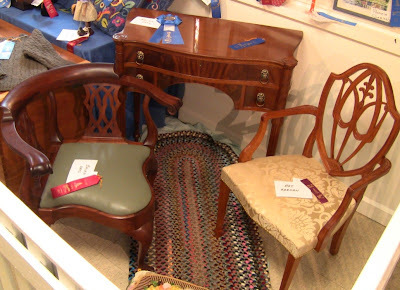 Corner chair and dressing table by Brian Days and dining chair by Art Keenan. Shaving stand by Art Keenan. Once the rain stopped, we pulled the workbench back out. One of Phil's students, TC Mannetta, arrived to help out for the afternoon. He told me he reads the blog and had some very nice things to say about it. He said he had never used a wooden handplane, so I gave him a quick lesson. The large wooden jointer is a bit awkward at first due to its different shape and balance, but you get used to it after a few passes. Once TC got it down, I showed him how to withdraw and set the iron with a plane hammer to adjust the shaving. We took turns the rest of the day showing people how to use it. At one point, a gentleman wearing a Wooden Boat cap stopped to watch. I asked him if he was a boat-builder. He said he had built one, but he was really having trouble sharpening his chisels. So I pulled out my portable sharpening station and an old chisel I got at Nashua and gave a quick lesson on double-bevel oilstone sharpening. However, I told him Phil uses a hollow-ground/waterstone sharpening method, so we would have to fight it out. In a few minutes I had the chisel taking nice end-grain shavings on the pine. While Phil talks to someone at left, TC Mannetta takes a shaving with the wooden jointer, and a young lady works a curve with the spokeshave. Another young man uses the spokeshave while Phil works on decorative elements for a dresser and TC adds to the pile of shavings. I'll be back at FIM November 30 and December 1 demonstrating at the free Lie-Nielsen Hand Tool Event. Stop by and meet Phil, see the Institute, and try out the full line of Lie-Nielsen tools, which will be available for sale or order. You can read about last year's Hand Tool Event at FIM here. What a great event and kudos to you for giving people hands on experience. Who knows what impact you have when you do something like this? Giving that lad the 151 would make Paul Sellers proud mate. Thanks, Neoshed! I had Paul's spatulas in the back of my mind when I set up the spokeshave for people to use. Julian still loves the tool, treats it very respectfully, is experimenting with blade depth, and is going through every piece of wood our property has (thank goodness for the downed tree in last year's storm). Thank you! That's awesome, I'm so glad to hear that!